A classic summer dessert and one of my family's favorites, is Strawberry Cake. 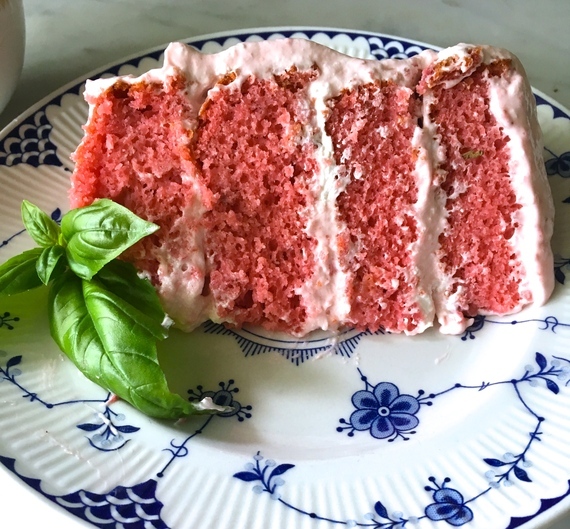 The pureed strawberries in the batter make it moist and it's usually better a couple days after it is baked. I felt like adding a bit of a kick to this fresh summer delight. The cake batter recipe would be hard to improve...you know the basic white cake mix/strawberry jello one? So I tweaked the icing recipe to give the finished product a little something extra. 1. Preheat the oven to 350 degrees and whisk the cake mix and gelatin powder together. 2. Puree the Strawberries in a food processor. 3. Add all but 1/2 cup of the pureed strawberries, eggs, oil, and water to the dry ingredients and beat with a mixer until blended. 4. Pour batter into two round cake pans and put in the oven. Bake time may vary depending on what size pans you use. I used smaller thicker ones, so my bake time was 40 minutes. Use your judgment and a toothpick to check doneness in the middle. Flatter pans will probably cook in 20 minutes. 5. In a large bowl, combine remaining strawberry puree, cream cheese, powdered sugar and chopped basil. Beat with electric mixer until blended. Add more powdered sugar as needed to thicken icing. Fold in the Cool Whip. Place in the freezer to allow the icing to harden a bit. 6. Once cakes are removed from the oven, allow them to cool completely on a cooling rack before adding icing. 7. Spread icing evenly and arnish with fresh strawberries and basil leaves. It is delicious served cold. As I was making this cake, I was reminded of a beautiful story that I've never been able to get out of my head. First of all, Aimee Bender is an excellent writer. Her sentences are just unique, interesting and poetic. 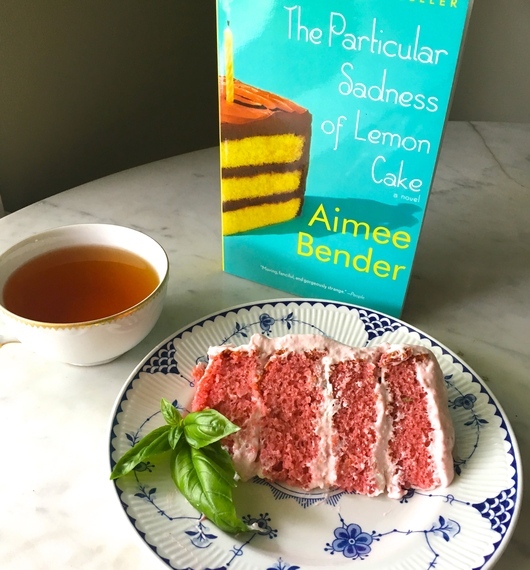 "The Particular Sadness of Lemon Cake" is the story of Rose Edelstein, a young girl who has the ability to taste people's emotions in the food they prepare. She first realizes her skill on her ninth birthday, when she bites into her lemon chocolate cake and tastes her mother's sadness. "...the goodness of the ingredients--the fine chocolate, the freshest lemons--seemed like a cover over something larger and darker, and the taste of what was underneath was beginning to push up from the bite. I could absolutely taste the chocolate, but in drifts and traces, in an unfurling, or an opening, it seemed that my mouth was also filling with the taste of smallness, the sensation of shrinking, of upset, tasting a distance I somehow knew was connected to my mother..."
A lot of interesting things happen to Rose as a result of her strange talent. You will have to read the book to find out. I highly recommend it! Also, I made sure to think of happy feelings while I baked my cake. 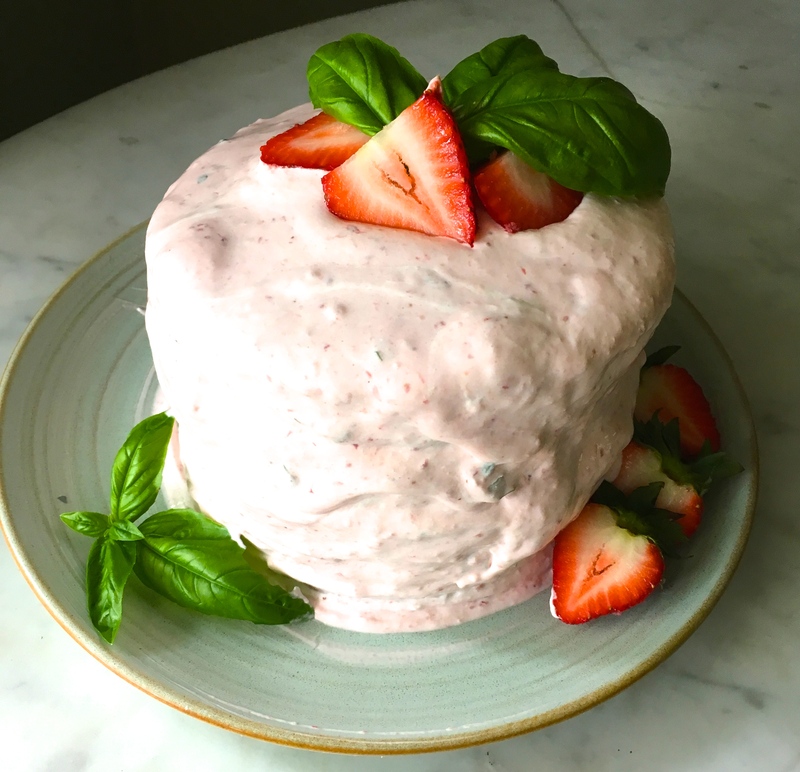 I suppose you could say this is the particular happiness of strawberry basil cake.